home - blog - Bed Linen, Linen Pillow Cases, Linen Sheets, Linen Throws - Duvet vs comforter: Which do you love most? Duvet vs comforter: Which do you love most? Depending on where in the world you are, and what side of the ‘duvet vs comforter’ debate you’re on, you may find yourself puzzled about what exactly are the differences between the two. 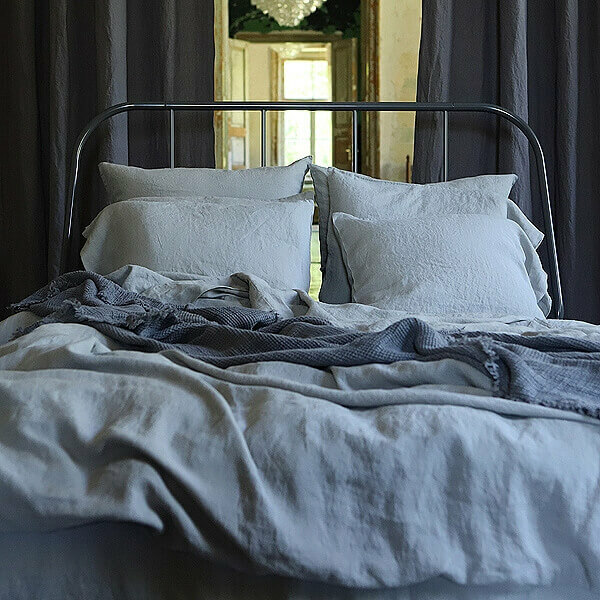 We at LinenMe spend a lot of time thinking about sleep: about how we can help you sleep better, more peacefully and in the softest, best-looking bedlinen. So this week we thought we’d explain the differences between a duvet cover and a comforter, and we’ll even tell you which one we love most. Can you guess? Really when we’re talking about the difference between a duvet and a comforter, we’re referring to the duvet cover itself. The duvet is the feather and down- or synthetic fibre-filled padding that covers us while we sleep, and the duvet cover is the sleeve that slips over the duvet to protect it. A bit like a pillow case and pillow, the duvet cover is removable and changeable, whilst the duvet remains the same. They usually fasten at the end, or have an opening for easy access. In Australia a duvet is known as a ‘doona’, and is used with a ‘doona cover’. Duvets fit closely to the size of the bed and usually need to be dry cleaned, but the duvet cover can be washed and changed regularly. A comforter is a padded or quilted cover that lies above a flat top sheet. It’s often used by those of us who love layering our bedlinen, and is used as a kind of extra blanket. Additional throws or wool blankets are sometimes used on top of a comforter for extra warmth or to dress up the bed. Confusingly, in the USA the word ‘comforter’ can be used to describe a duvet. Comforters are made with natural or synthetic fillings and can sometimes be machine washed. We love both – the secure, extra-snug feel of a comforter nestling above a top sheet, and the quick and easy shake of a duvet to make the bed. But if we had to choose we’d go for the duvet and duvet cover because we love how easy it is to change the look and feel of a room without having to redecorate, and we like the no-hassle ‘flap and go’ approach to making the bed in the morning. To browse our collection of pure linen duvet covers and bedlinen sets go here. From tranquil neutrals to warm, jewel-bright colors, we’re sure you’ll find something you’ll love for a cosy, luxurious night’s sleep. For more on decorating you bedroom with linen try this. Wonderful, soft, high-quality duvet vs comforter. I absolutely love this!